Sewing buttons on to a knitted fabric is a little on the tricky side because the "weave" of the fabric is so loose in contrast to a traditional woven fabric. If you have a functional button you want to try your best to sew the button on so that it is stable and not tugging and stretching your stitches. It is for this reason that we recommend sewing a back button on to the inside of your. If your button is merely there to look pretty you will not have to worry about stabilizing it. 1)Start by threading your needle and doubling the thread, then knot it. 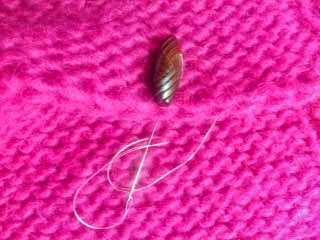 4)look for your knot and place the needle in between the two threads. This will enable you to lock in your thread, the knot itself will just pull through if you do not secure it. 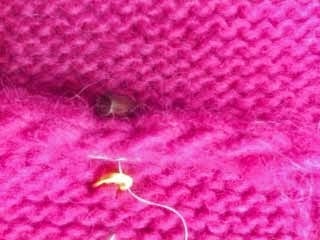 5) pick up your flat button and pull needle and thread through one of the holes and back through another catching some of your knitted fabric. Repeat pulling your needle and thread through the holes and somewhat anchoring the back button, then pull the needle and thread through the fabric to the location where your button will be visible and pull through your visible button again. 6)From here you pull through the visible button and locate the back button and pull through the holes in that button over and over again. 8) end with your needle on the inside and layered between the inside fabric and the button: wind your thread around the core of the stitches that have gone back and forth around 4 times and then cut your thread. 9) your button should be very stable and not move ( if it does..start over again). I now understand why Tutorials on Videos are so successful. It is really hard to describe all of the little nuances one goes through without the visuals. Now I have another challenge....to follow this up with a video!